Today let us consider the apple, whose dominant acid content, like the grape, is malic. The thought process that drove this drink was very similar to that of the Peanut Butter Jelly Time. In both drinks, I have taken a classic flavor pairing which would ordinarily be cloying in a drink, and balanced its sweetness with malic acid. The standard procedure for this type of drink would adulterate the purity of the pairing with lemon juice, but with malic acid, we can find balance by adjusting a sourness which is already found in one of the key elements of the pairing. Earlier this week, I had a drink made with tarragon and apple juice, and yet all I could taste was gin and lemon. This is a common problem. 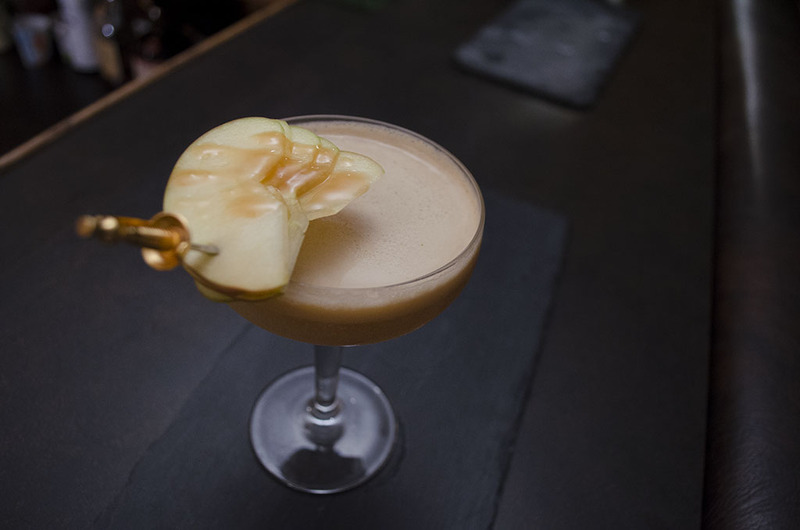 I wanted to make an apple drink that tastes strongly of apples, but which would taste more like summer than autumn, and to that end, I pursued a staple of the summer county fair, the caramel apple. Shake over ice and strain into a coupe. 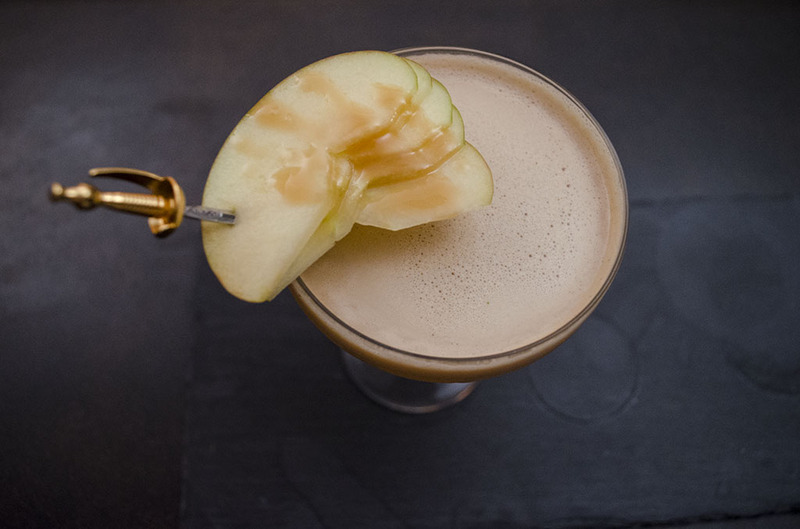 Garnish with a fan of thinly sliced apples and a try-hard caramel drizzle. I made a caramel sauce using some Barbados rum that is probably better for cooking than drinking, and it adds a layer of toffee and sugar flavor to the already caramel tones of El Dorado 15. Caramel is the juncture for apple and rum, and I also suggest dropping shot of your most caramelly rum into a glass of apple cider. Apple is the juncture for anise and caramel, so that the sugar flows into the apple flows into the herbal flavor of anise. You can follow this caramel sauce recipe, but swap out the water for your least expensive dark rum. Chinese five spice bitters threaten to take this into autumn territory, but fortunately the fennel and anise flavor is the loudest, and the cinnamon and clove are mercifully quiet. Categories: modern drinks, original creations | Tags: absinthe, alcohol, angostura bitters, anise, appl, apple cider, apple juice, bartending, booze, caramel, chinese five spice, cocktail, cocktails, craft cocktails, dark rum, demerara, drinking, drinks, el dorado, fennel, liquor, malic acid, mixed drinks, mixology, rum | Permalink. Outstanding! This looks like a lot of fun to make. Had the pleasure of trying this last night. What a beautiful drink! Delicious and well balanced, it tastes as good as it looks. Thank you, Joe!